DryTrak is a basement waterproofing system that removes water from the wall and cove areas of your basement. When combined with a TerraFirma high-performance sump pump system, DryTrak drainage provides an effective, worry-free solution to your basement water problems. You can learn more about DryTrak and if it is the best solution for your basement by scheduling your free on-site consultation with one of our certified basement waterproofing specialists. Contact us today for a free quote in Seattle, Portland, Tacoma and the nearby areas. 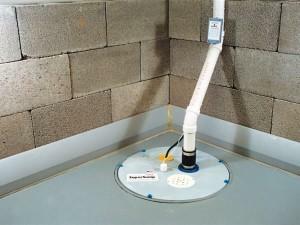 The DryTrak® system is designed to sit on top of the basement floor and collect any water in the basement. Normally, foundations are built in three pieces -- the floor, the walls, and the foundation footing. In the case of monolithic floors, there are just two pieces as the floor and footing are poured as a single piece. As a result, the edges of these floors are extremely thick and jackhammering them is a labor-intensive task that creates a large amount of dust. We address the challenge of basement waterproofing for monolithic foundations by installing our DryTrak® Drain Pipe System. This baseboard drain is permanently epoxied above the floor and above the mud sitting below the floor -- with no jackhammering. Why install the DryTrak® system? The major leakage zone in any basement is the perimeter, where basement walls meet the slab floor. Groundwater that seeps through basement walls will flow down toward the floor. Hydrostatic pressure created during wet weather will often force groundwater into the basement along the wall-floor joint. The DryTrak® drainage channel is designed to capture this water leakage before it reaches your basement floor. DryTrak® is compatible with all foundation wall types, and it will perform equally well on basements of different sizes and shapes. Our well-trained crews are often able to complete a DryTrak® installation in a single day. If you're interested in a basement drain system for your home, call TerraFirma today for a free estimate in Seattle, Portland, Tacoma, Vancouver, Bellevue, Eugene, Renton, Hillsboro, Salem, Gresham and the nearby areas.